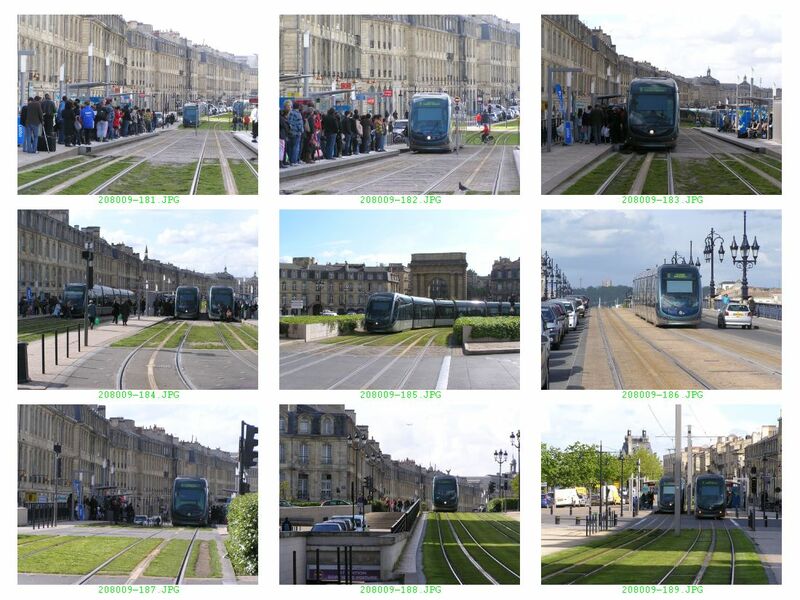 Bordeaux's magnificent river frontage - served by trams, but due to the innovative "APS" system, not "despoiled" by poles and overhead power lines. 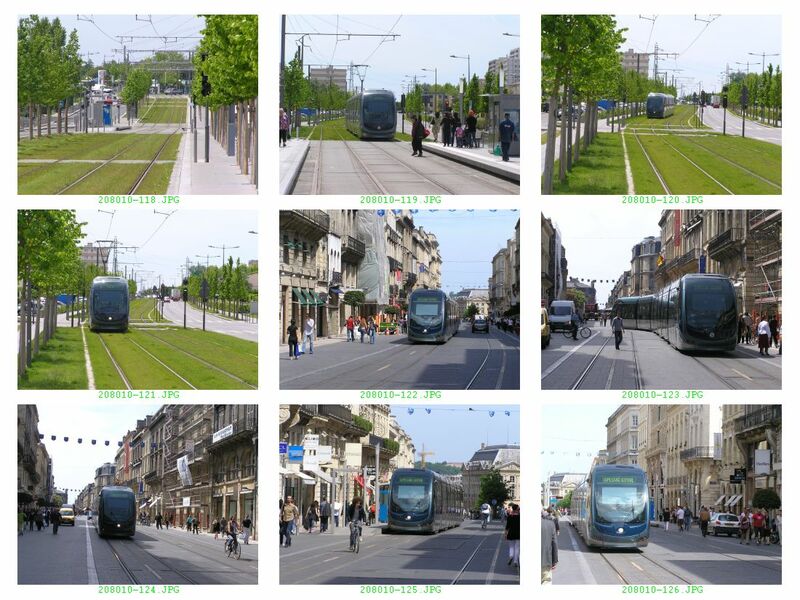 In the city centre power supply is also by a central conductor strip between the rails. 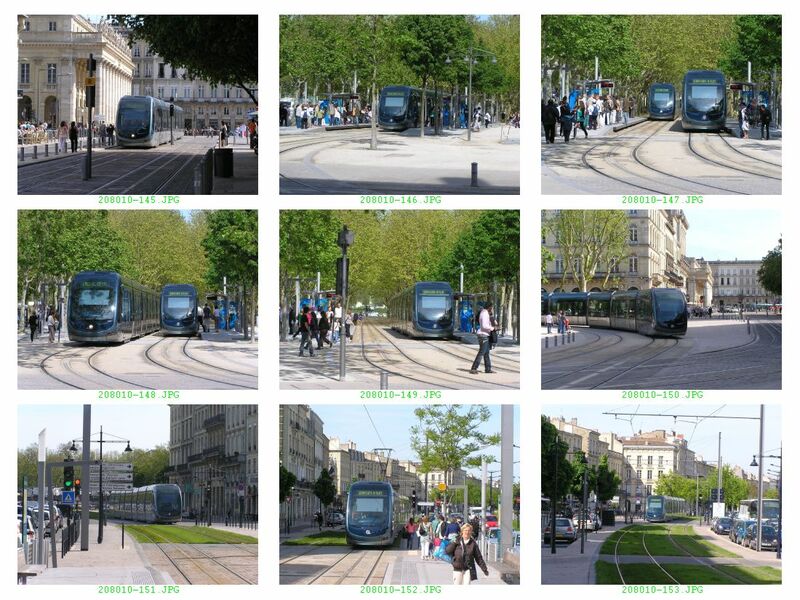 This tram is heading south on line B and is approaching The Grand-Theatre tram stop located on Cours de l'Intendance. 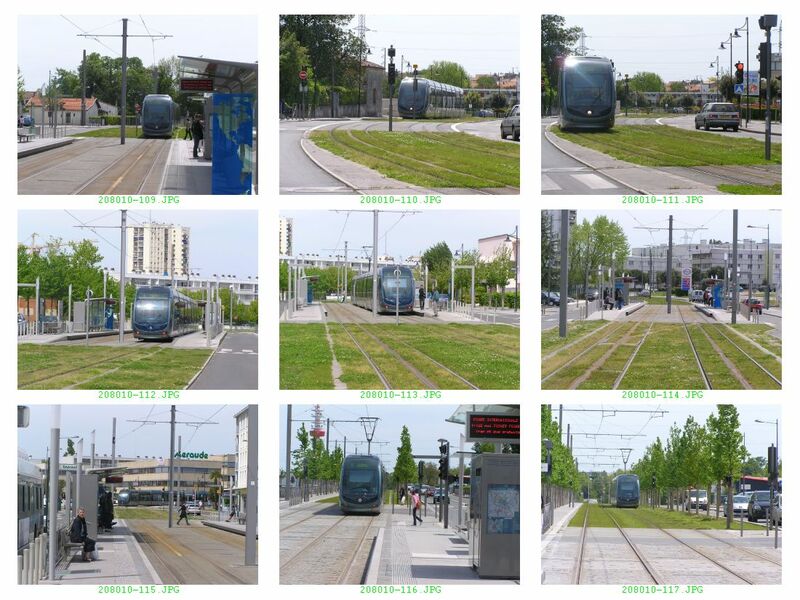 Outside the city centre and with certain exceptions, trams run "under the wires", but great effort has been made to make the surroundings pleasant. 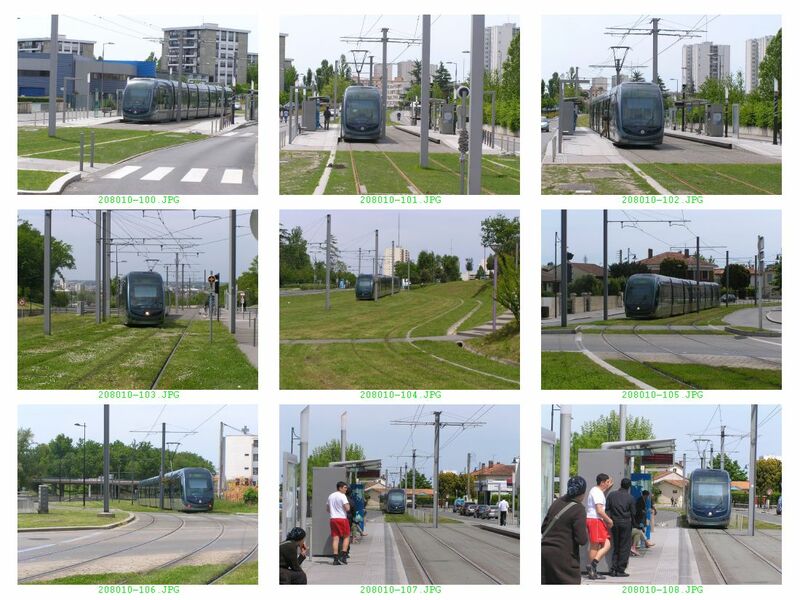 This tram is heading out of the city on Avenue de Thiers where trees have been planted and the reservation grassed. 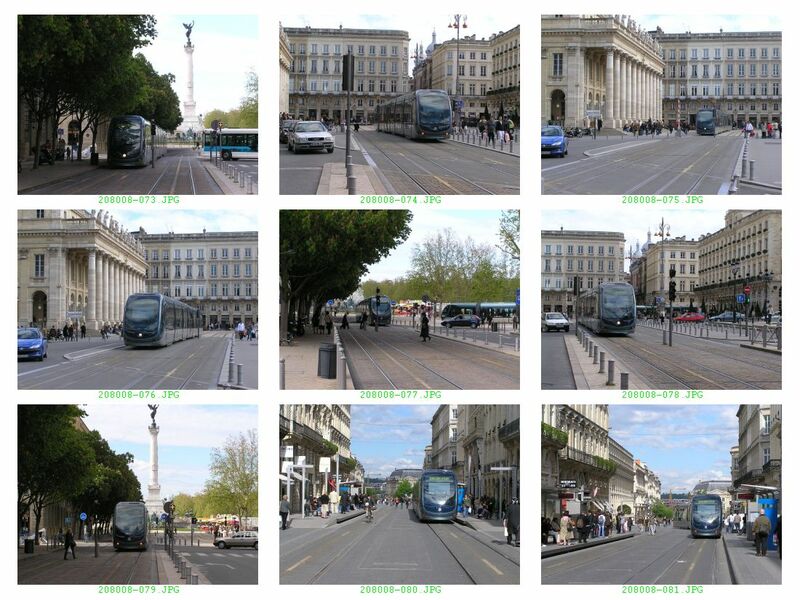 Had all gone to plan, it would have been a remarkable event. 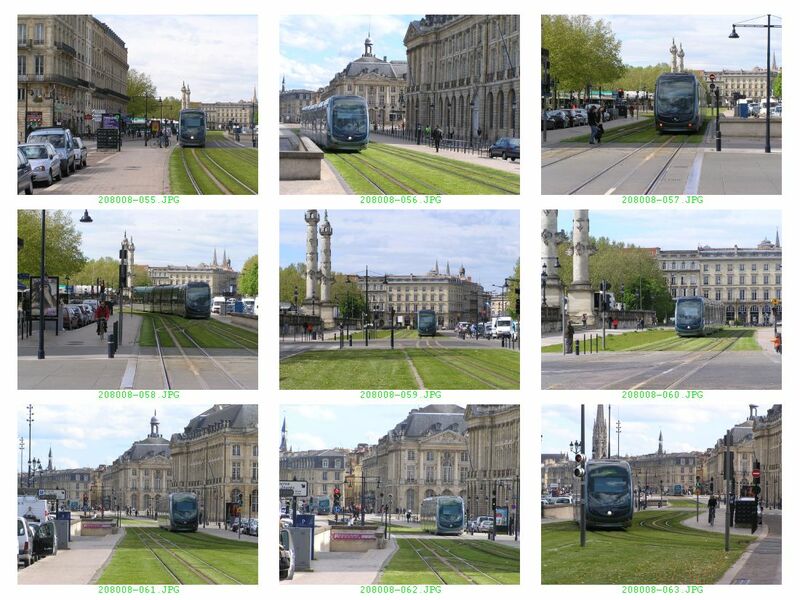 Three complete new lines through the centre of Bordeaux would have been opened at the end of 2003 in one of the most remarkable tramway revivals ever. 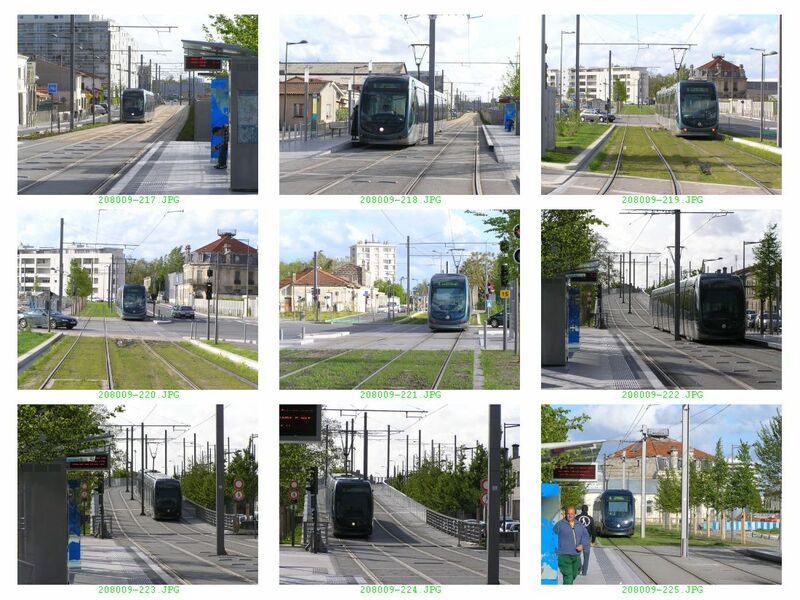 As it was, the eastern part of Line A opened from Meriadeck, through the city centre and across the Garonne river to the neighbouring communities of Cenon (La Morlette) and Lormont (Lauriers) to the north-east of Bordeaux on December 21st of that year, and streches of the planned Line C (St Jean Station to Quinconces) on 24th April 2004 and Line B (St-Nicolas to Quinconces) on 15th May. 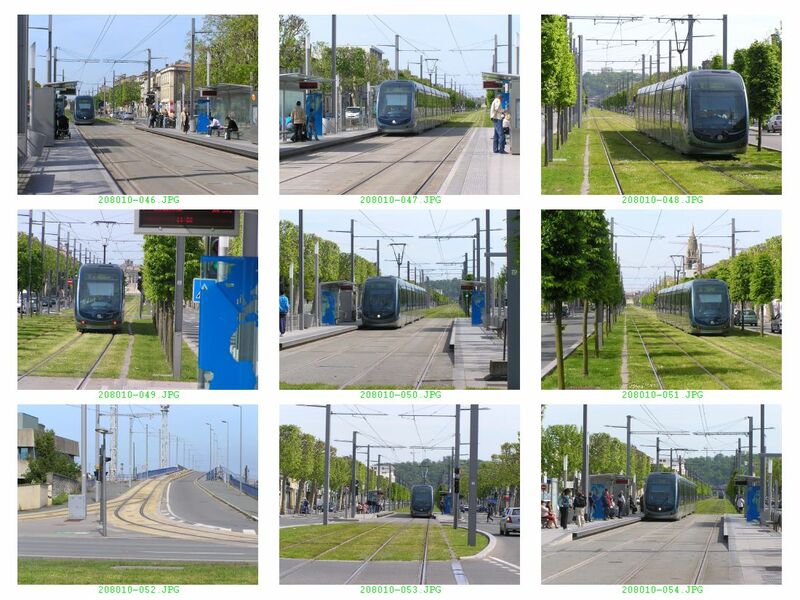 Together, these lines comprised 14.7 kilometres of route out of a total planned length of 43.3 km, which was to be opened in two main phases by the year 2007. 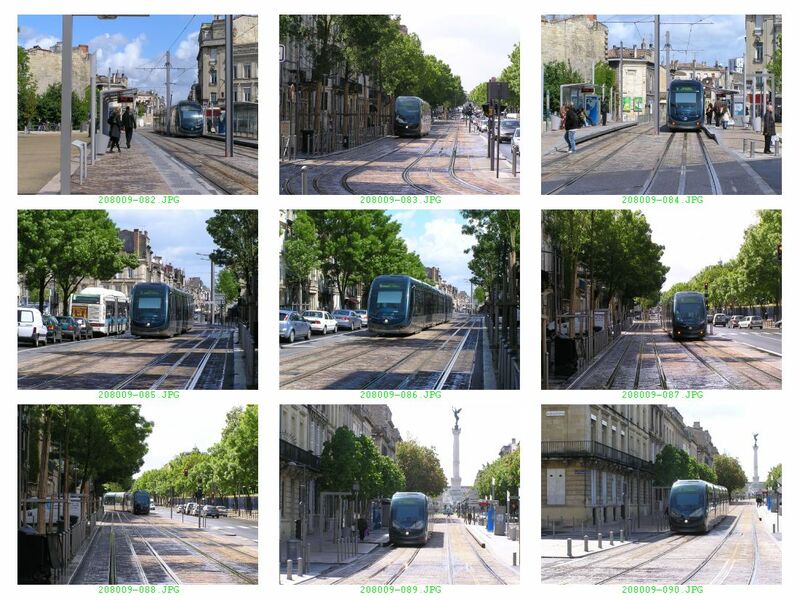 Despite the delays, the speed at which Bordeaux built its new tramway system was remarkable. 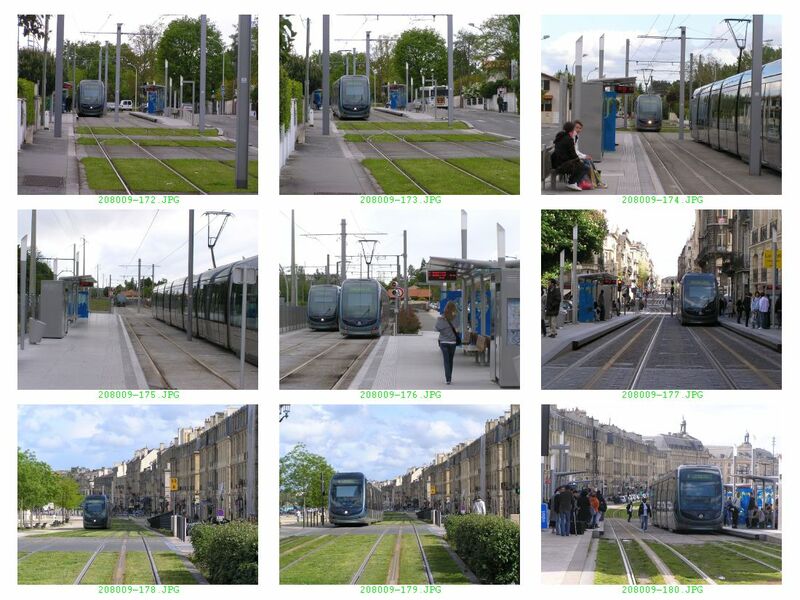 It was not until the mid 1990s that a tramway was seriously considered, yet on February 18th 1997, the association of communities forming the Bordeaux conurbation agreed to proceed with the project and the necessary Declaration of Public Utility (DUP) was granted by the French government on January 26th 2000. 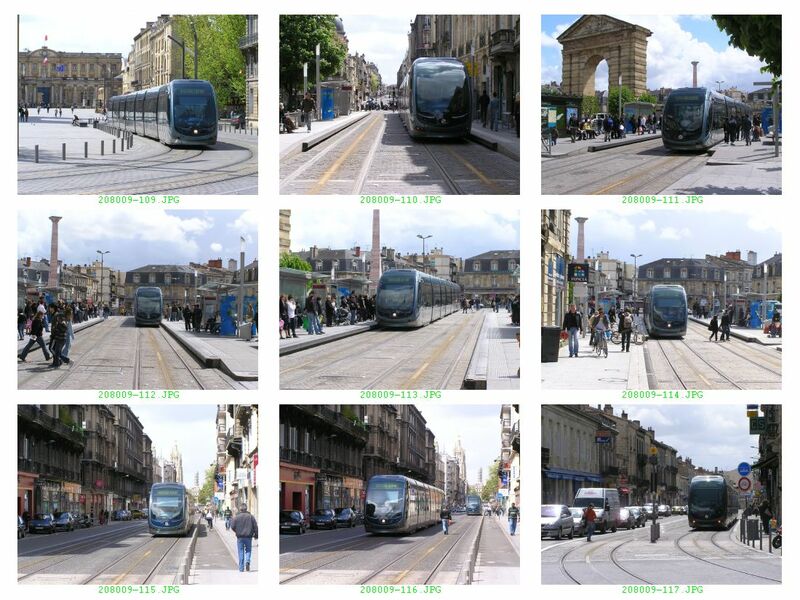 Even after receiving this go-ahead, the project was delayed by several judicial procedures and the ambitious plan to have the first stage opened before the end of 2002 was not achieved. 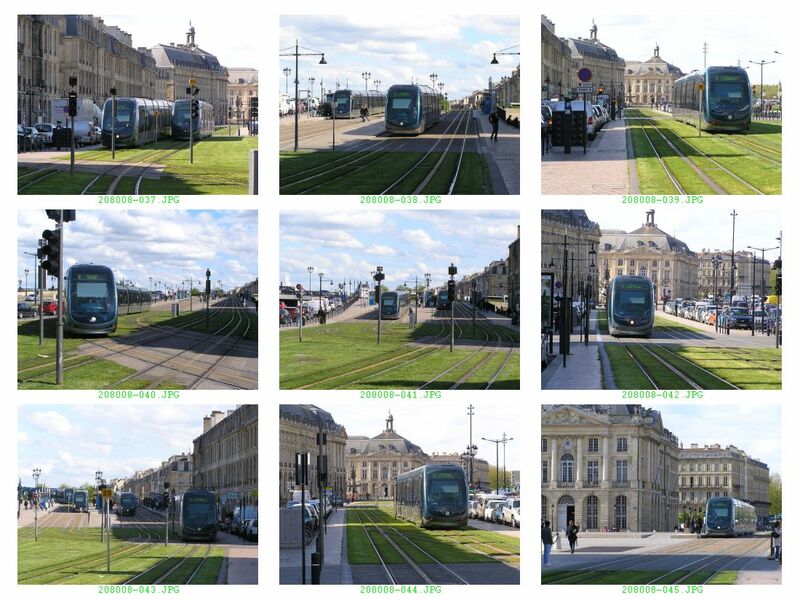 However, by the standards of any other European country, Bordeaux had not just one line, but an entire new network operating in double-quick time. 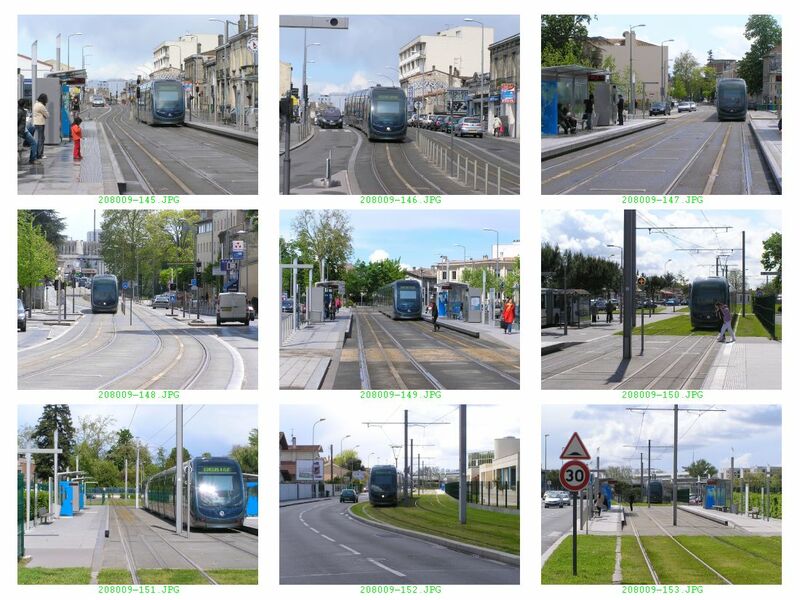 Despite the speed of construction, the job was not a slip-shod one. 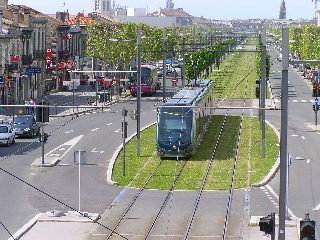 In common with modern French tramways, enormous effort was made to design an attractive system, blending in with the city's historic architecture (the entire city centre is an UNESCO World Heritage Site) and making the suburban alignments as attractive as possible with grassed reservations being used wherever possible. 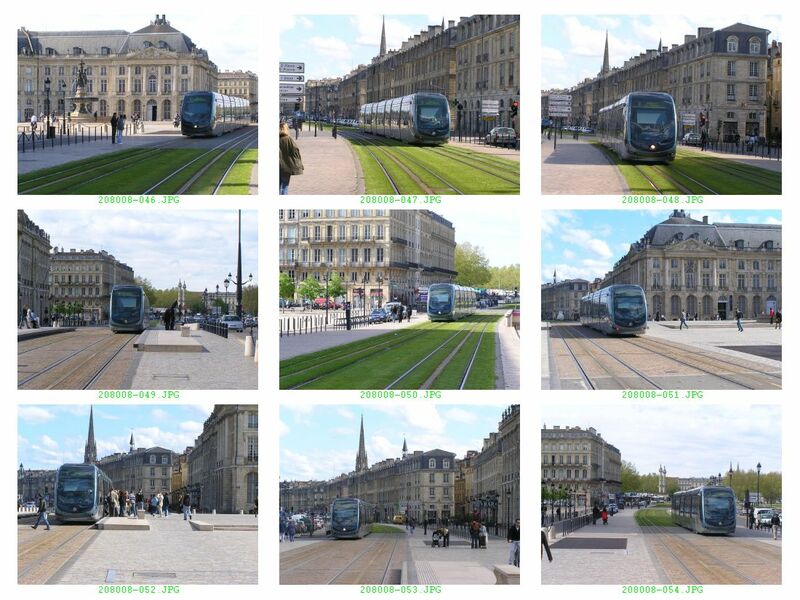 It did mean, however, that the centre of Bordeaux was one large building site duringthe period of construction. 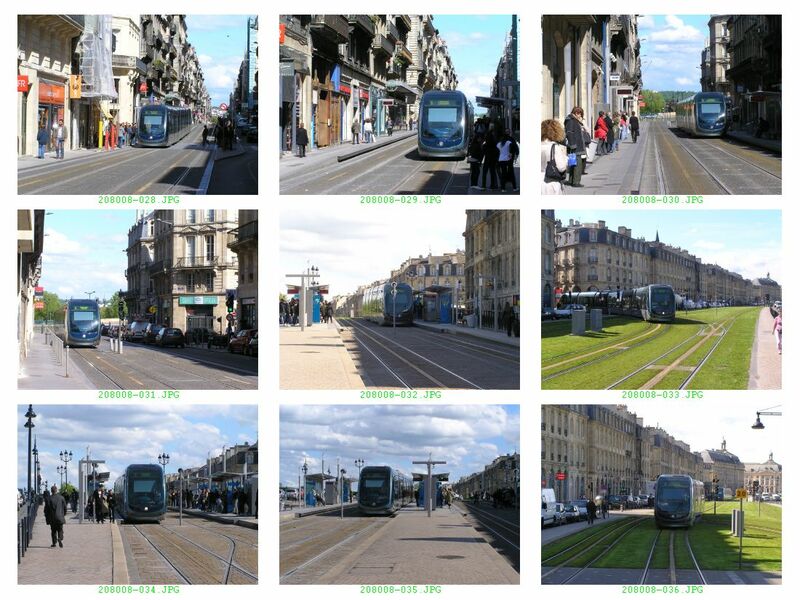 Three routes crossed the city centre, all on separate routes with each crossing the others at one point in the city centre meaning that three tram "interchanges" had to be built (these being at Hotel de Ville (Lines A and B), Porte de Bourgogne (A and C) and Quinconces (B and C). 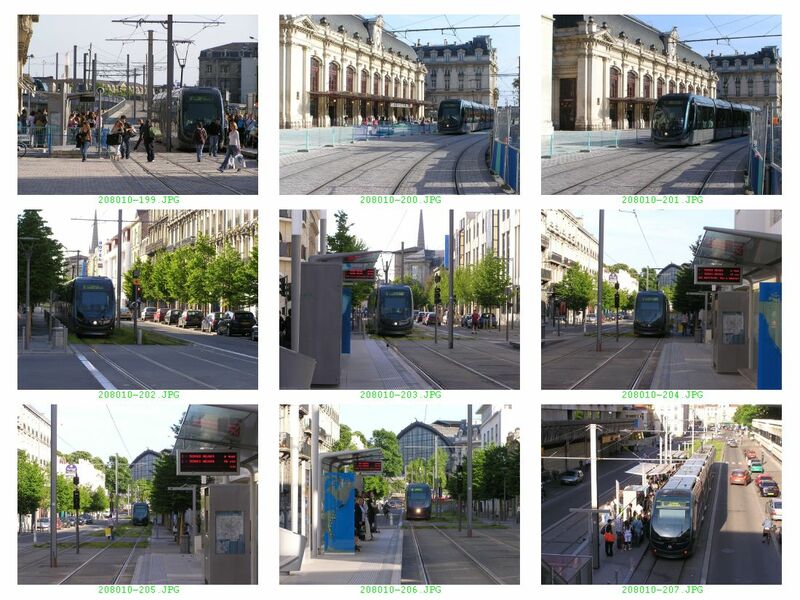 The big advantage of building all three lines at the same time was that, although disuption would be severe, it would be short-lived as the entire planned city centre network would be completed in one phase and future disruption would be minimal. 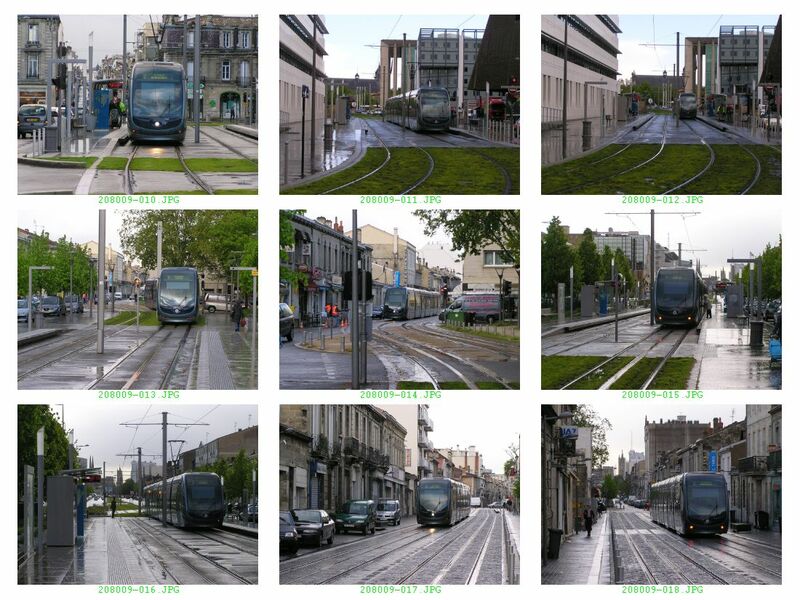 The delays which did occur were primarily due to one factor. 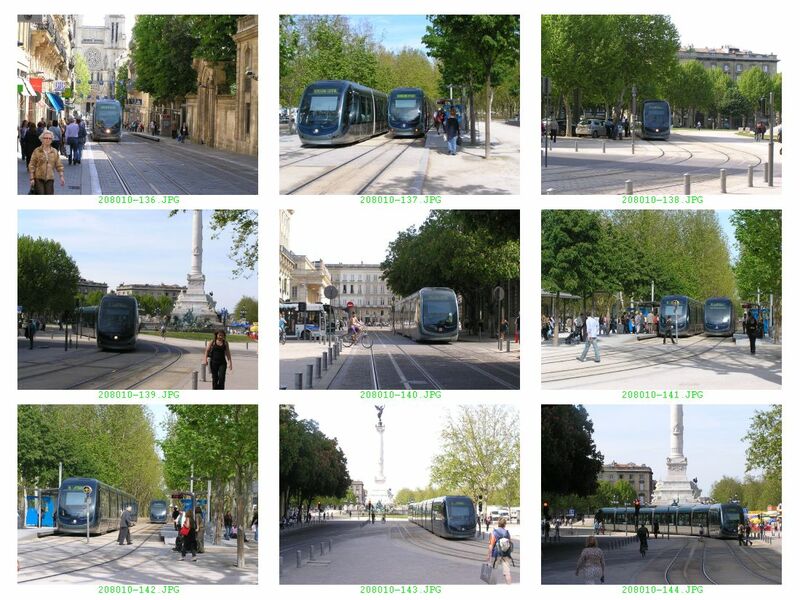 Not only was Bordeaux aiming for an ambitios network - it was also employing revolutionary, untested technology for current collection in the city centre. 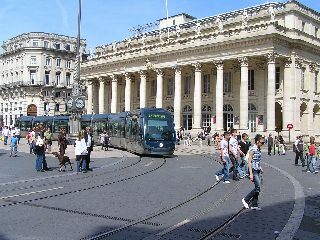 Bordeaux's "first generation", whose last operational line closed in 1958, was one of France's largest, and in the city centre, much of the tramway was powered from an underground conduit, so that no overhead was needed. 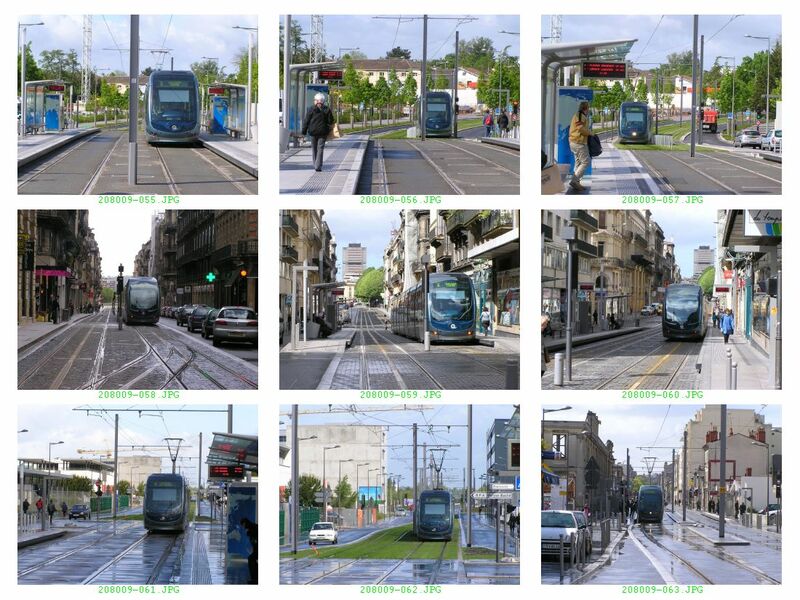 When the new tram system was proposed, many people assumed that a conduit system could also be reintoduced. 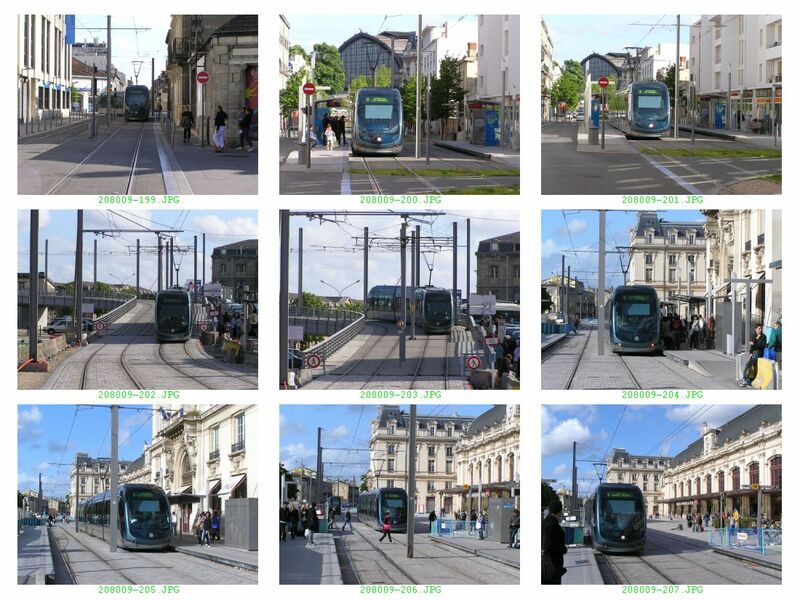 The cost and practicality of such a method of current collection effectively ruled it out, but the pressure to find a solution which spared Bordeaux's magnificent architectural vistas, especially that along the left bank of the Garonne remained, especially from conservatin groups. 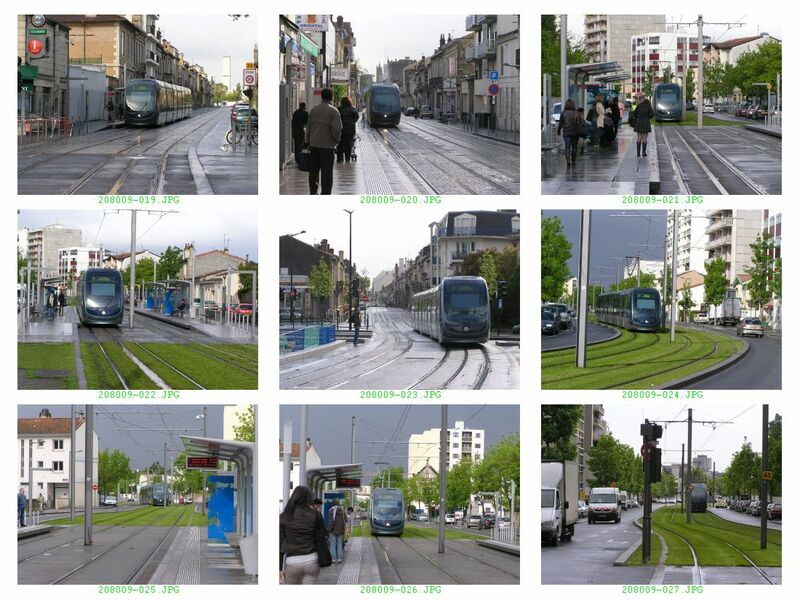 The system adopted was the so-called "Alimentation par Sol" (APS). 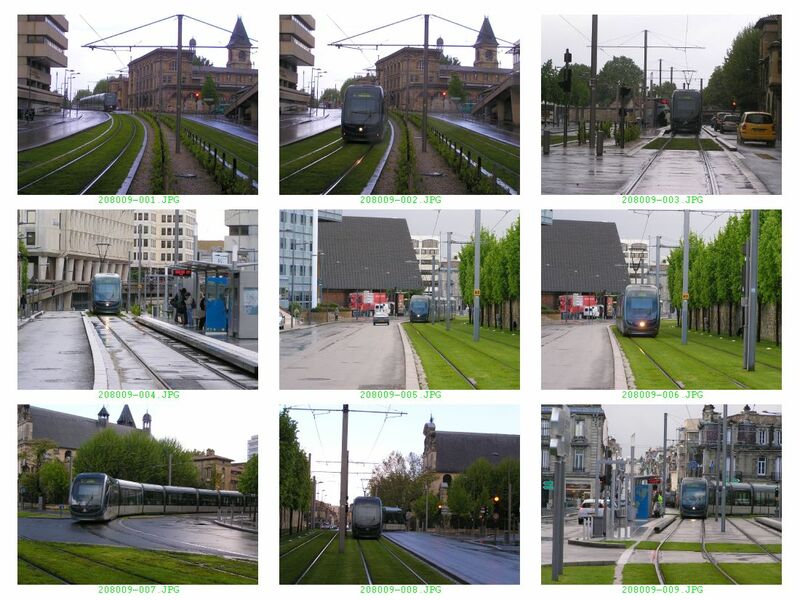 This involves the laying of a central conductor strip between the two running rails comprising 8-metre long conductor strips separated by 3.5 m long neutral strips. 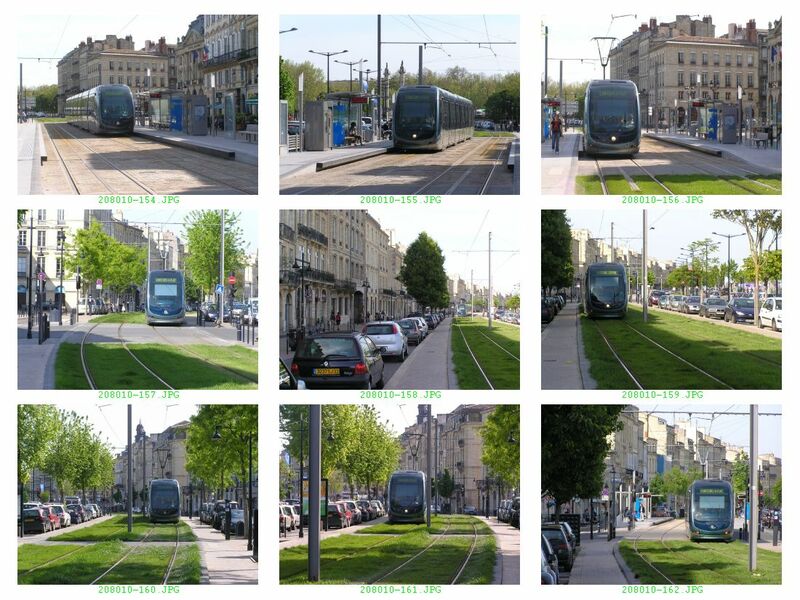 With power controlled by "Coffrets" (small boxes placed at a distance of approx 22 m apart), the conductor strip is electrified only once the tram is direct above any given 8-metre long section, so that no part of the conductor strip is "live" at any other time and is therefore totally safe for other road users. 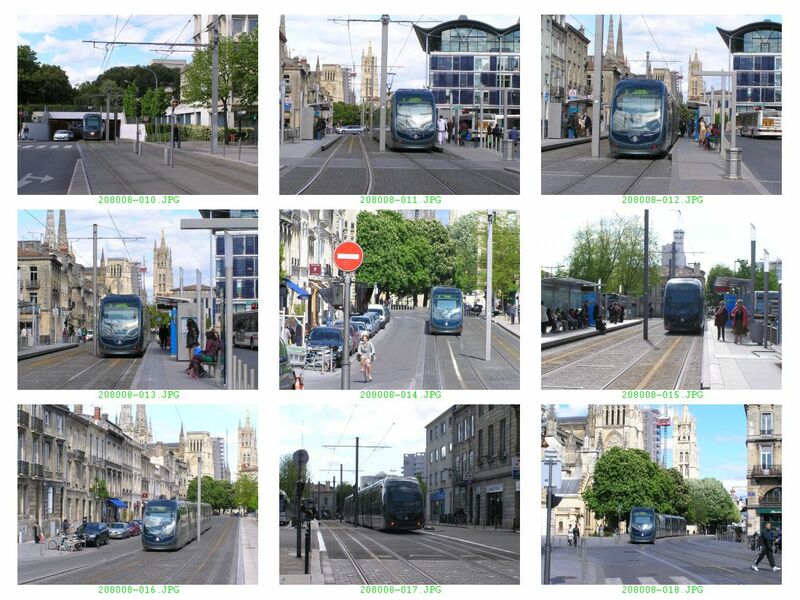 The APS system is now in use throughout the city centre and in certain stretches of line outside the city centre, but the cost (around 4 times that of tradtional overhead) and practicality (changeover to pantograph collection at tram stops) has kept this to a minimum - and even some small streches of APS have now been converted to overhead collection. 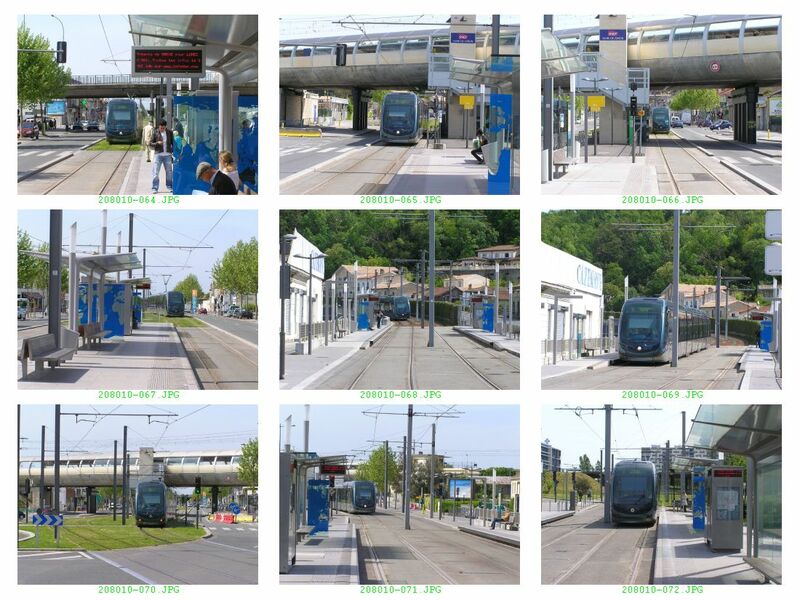 The APS system, like any untried technology, caused major problems with disruptions to services common in the first few months of operation. 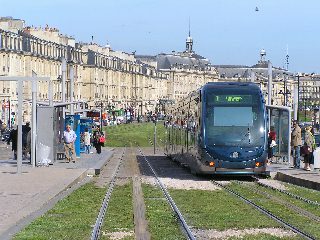 A (Blue) : West - North East : From Merignac Centre via Meriadeck, Hotel de Ville and Porte de Bourgogne, cross river to Cenon. 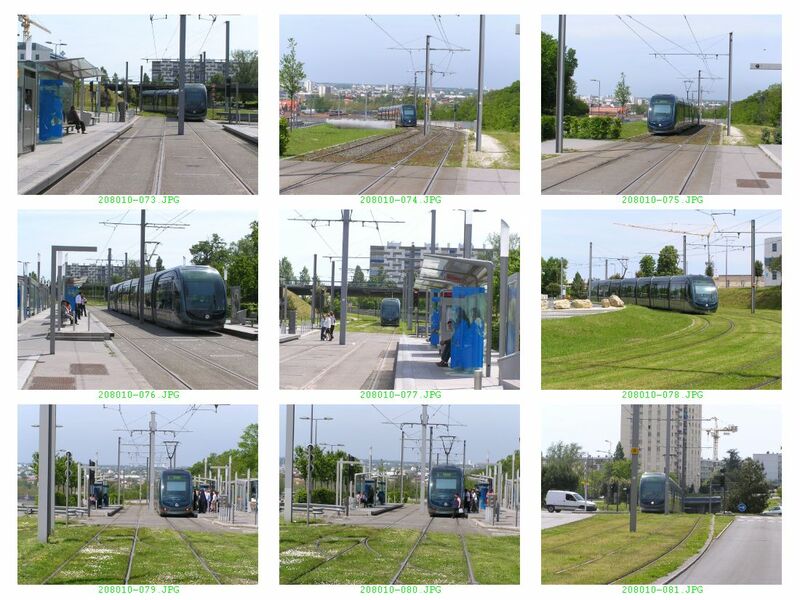 From Carnot - Mairie de Cenon the line rises steeply on a viadict to Buttiniere, where the line forks northwards to Lormont-Lauriers and south to Floriac Dravemont. 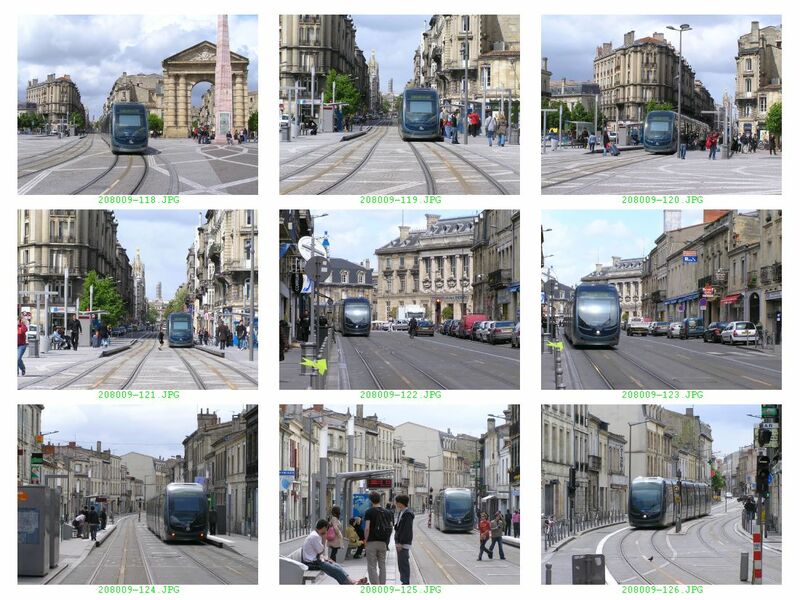 An extension is shortly to be ready to extend from Lormont-Lauriers to Bassens Carbon-Blanc. 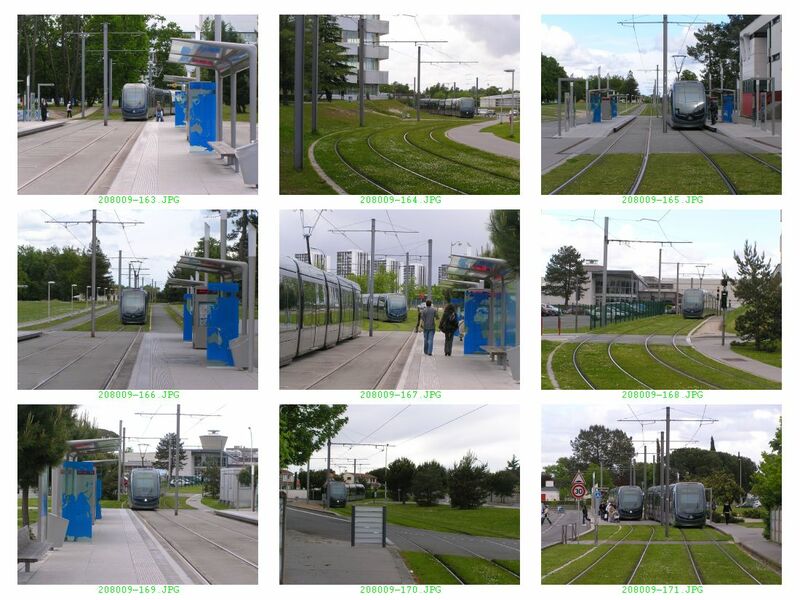 In the west, the line is planned to be extended to Merignac les Pins and longer term, with a branch from the existing line at Quatre-Chemins, to Boreaux's International Airport. 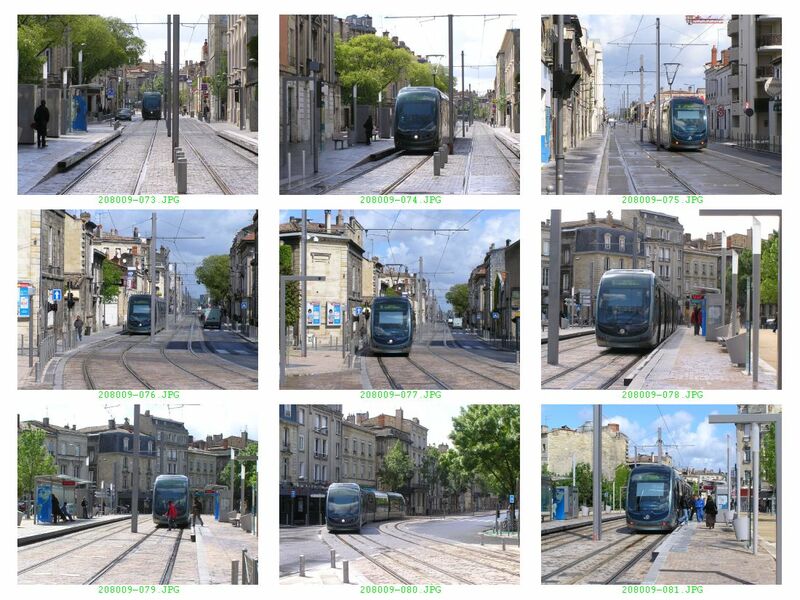 B (Red) : South West - North : From Pessac Centre via Hetel de Ville and Quinconces to Bassins a Flot. 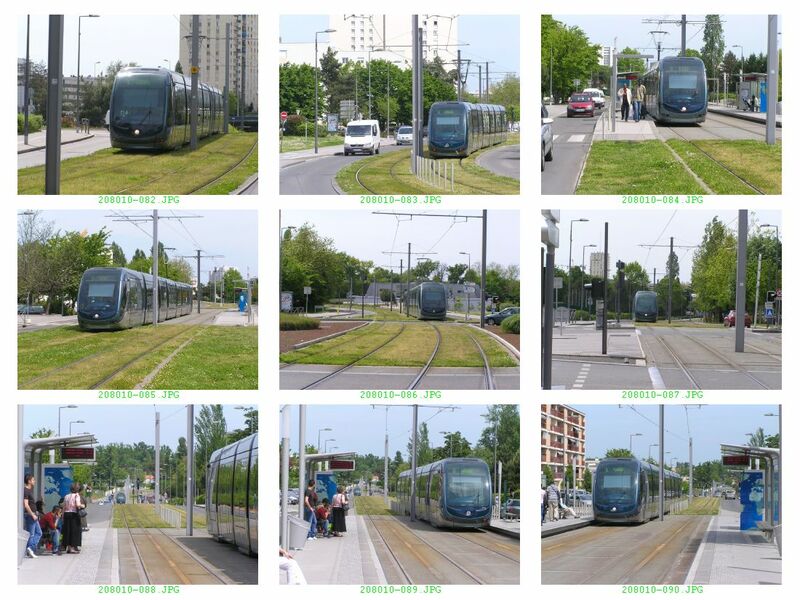 In the south west, a branch to Pessac-Alouette is in planning. 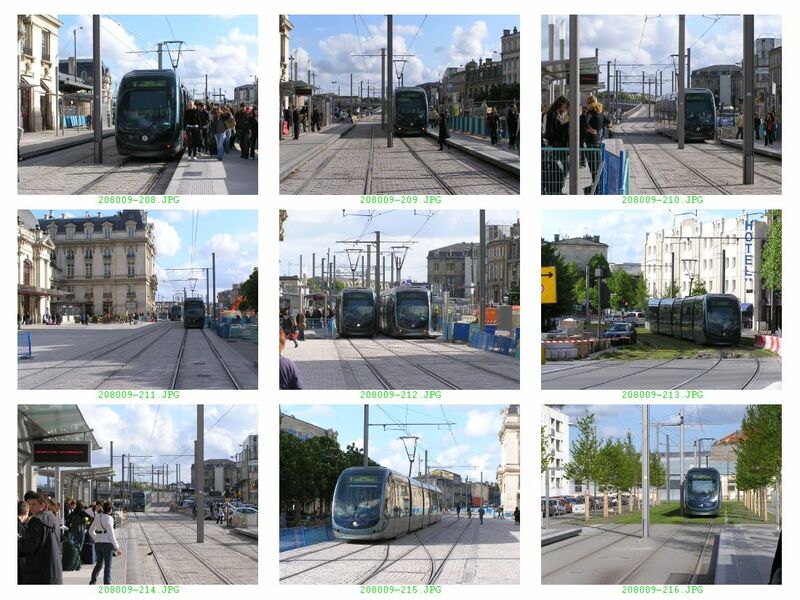 In the north an extension to Claveaux is under construction, with the ultimate planned destination being Bordeaux-Nord. 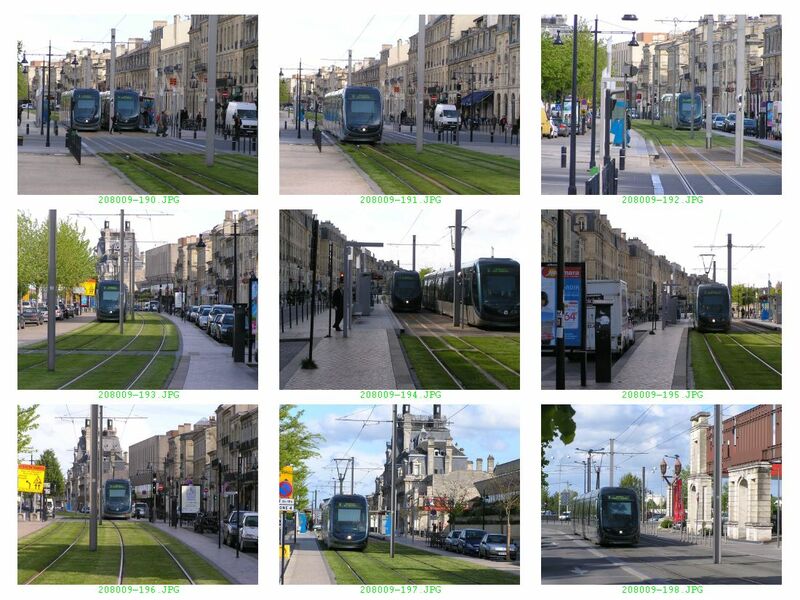 C (Green) : South - North : From Begles (Terres-Neuves) via Gare St Jean, Porte de Bourgogne and Quinconces to Les Aubiers. 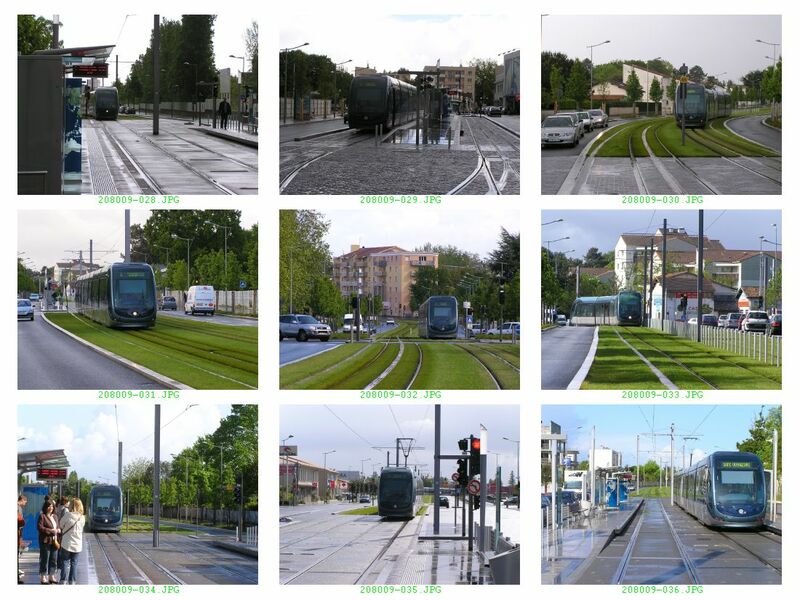 Extensions are planned for both ends of the line to Villeneuve-d'Ornon and Bordeaux Lac respectively. 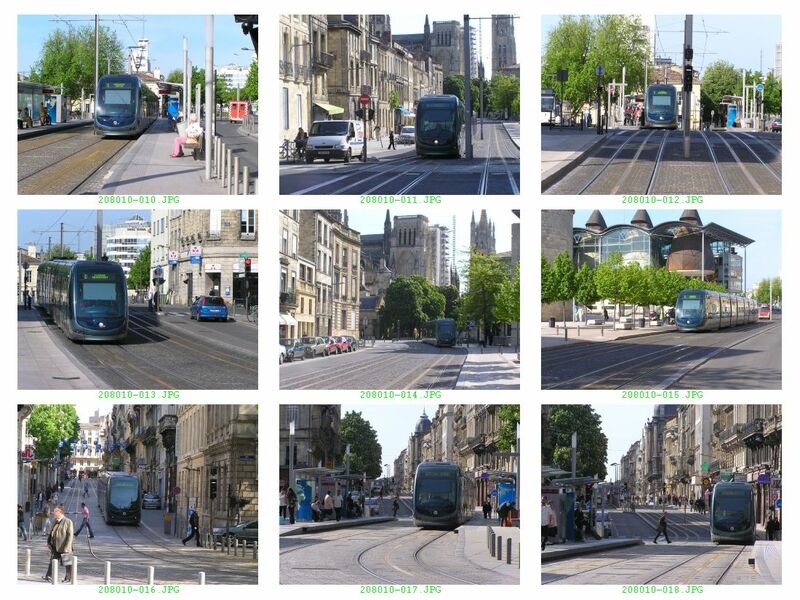 In the peak period, services run around every 4 minutes and this attractive level of service has had a very positive effect on patronage. 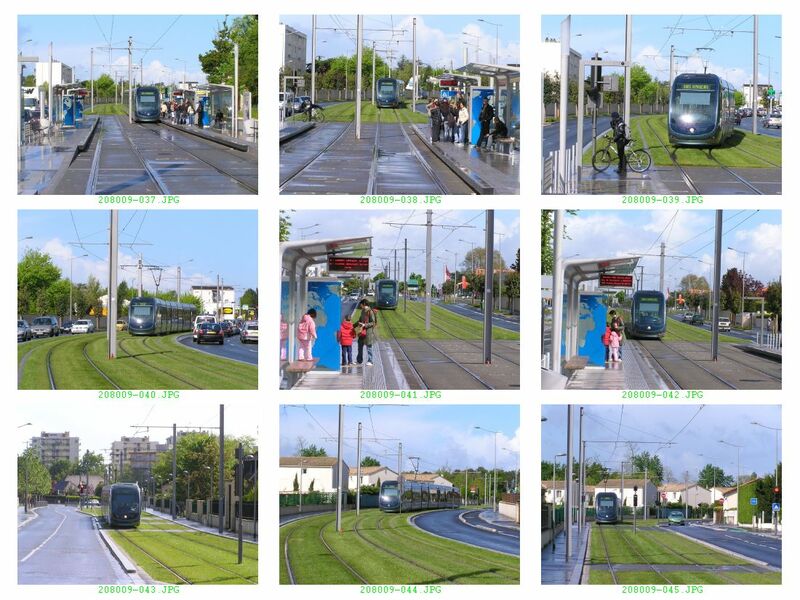 Trams are now carrying many more pasengers than were using the bus services in operation prior to tramway introduction, and overall passenger numbers are rising. 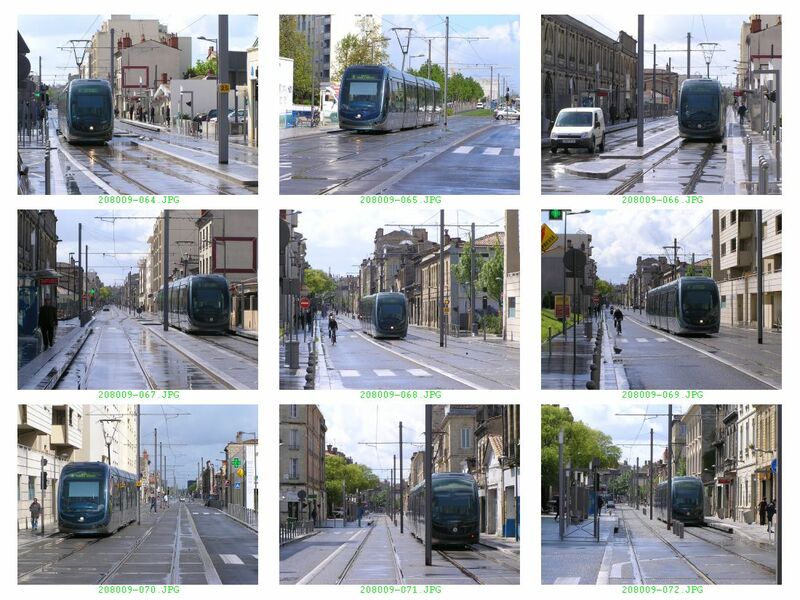 Trams can get extremely busy in the city centre. 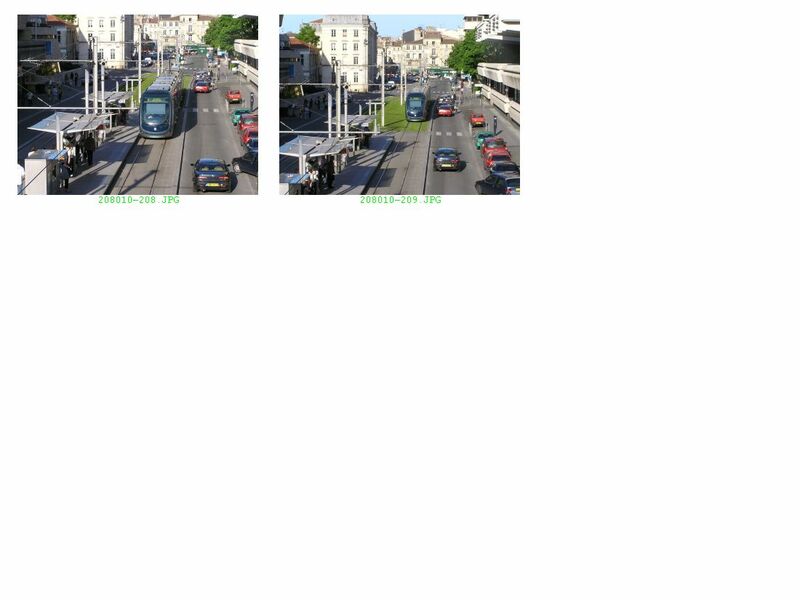 There is little scope for increasing capacity at present - and passenger numbers will no doubt increase once the planned extensions come into operation. 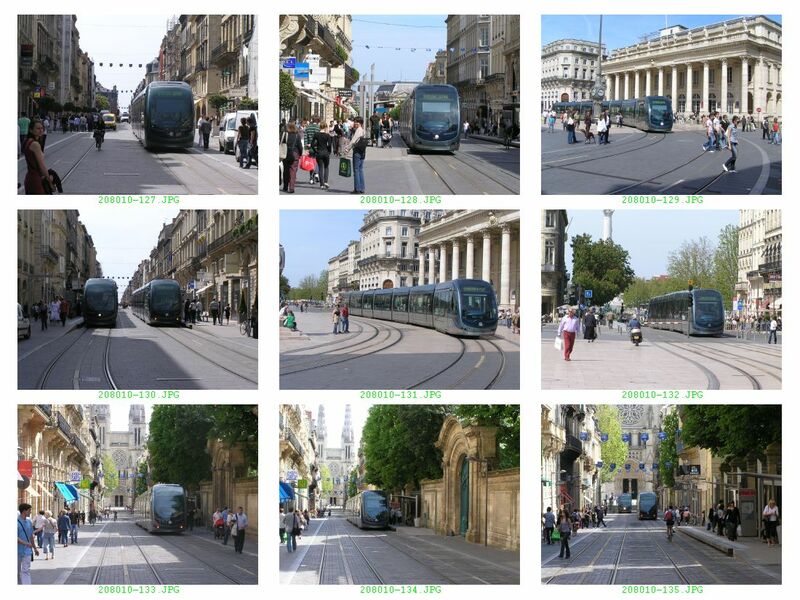 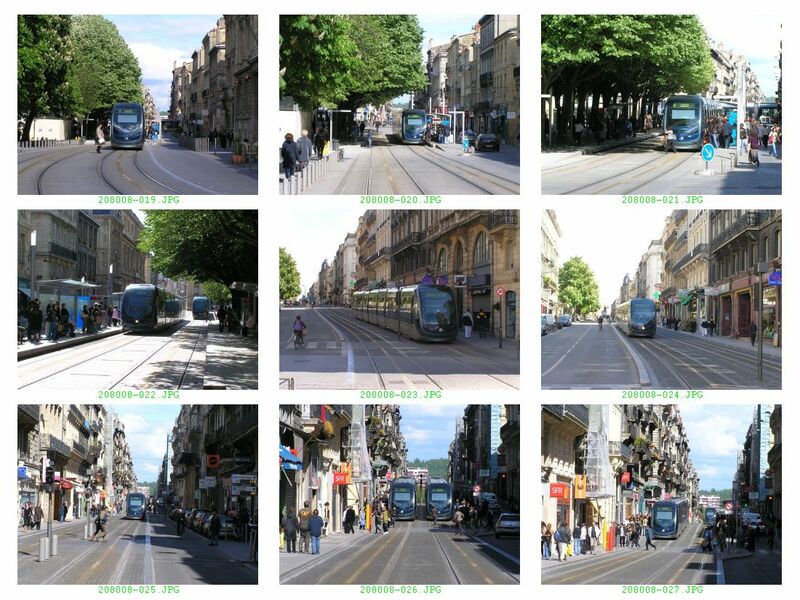 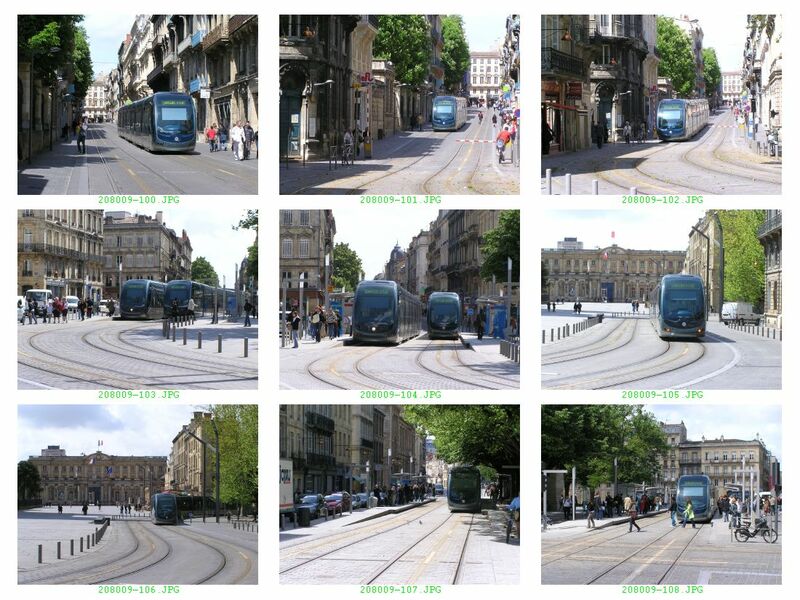 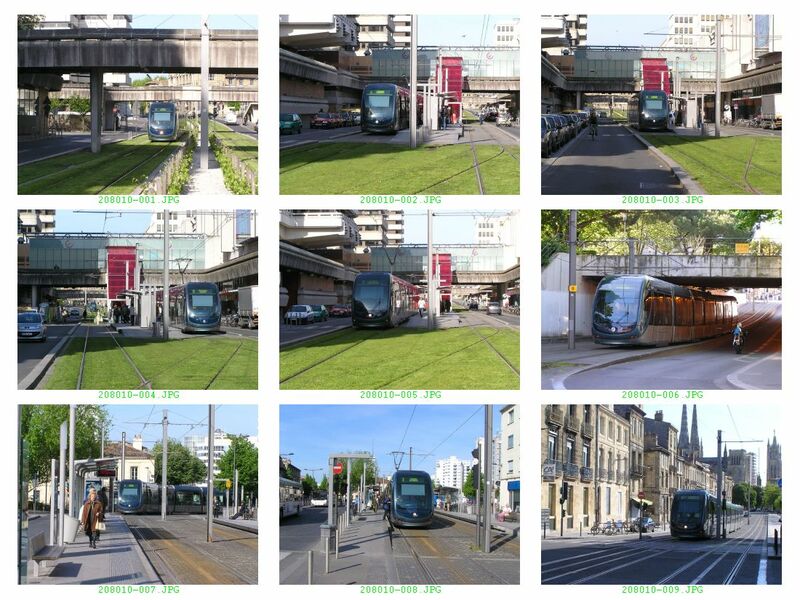 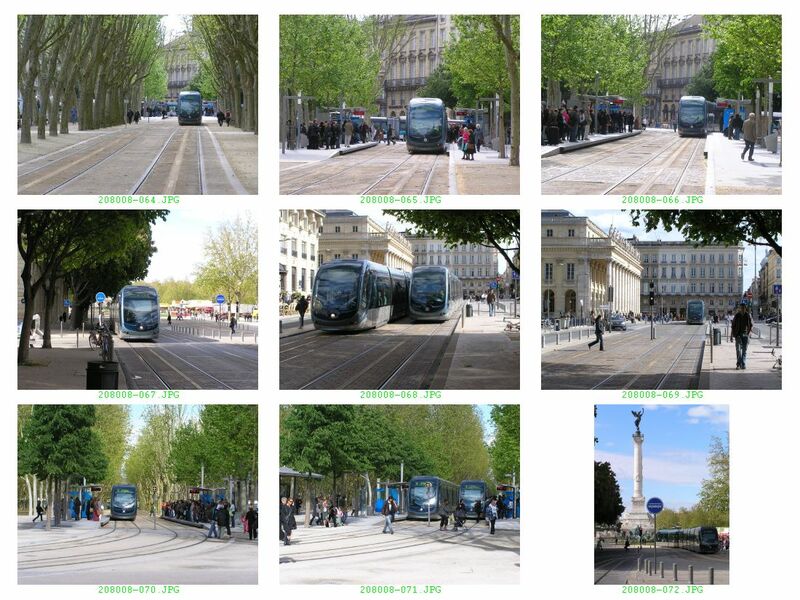 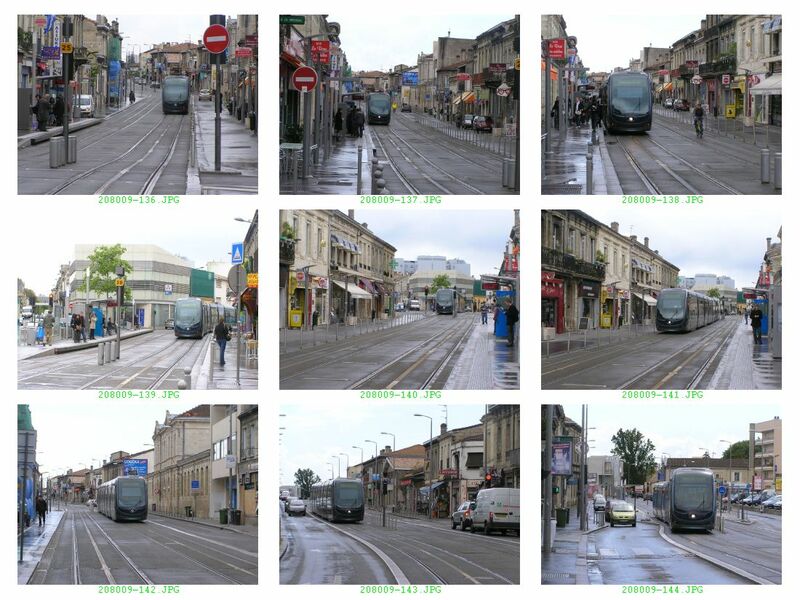 Bordeaux's tramway is now a massive success, both in terms of passenger attractiveness, and now that the problems with the APS system have been largely overcome, operational efficiency. 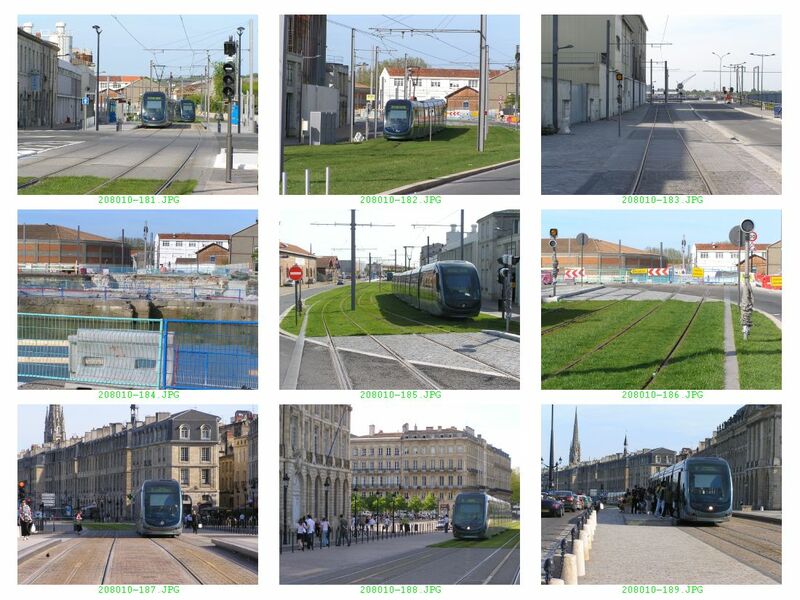 It is becoming a victim of its own success. 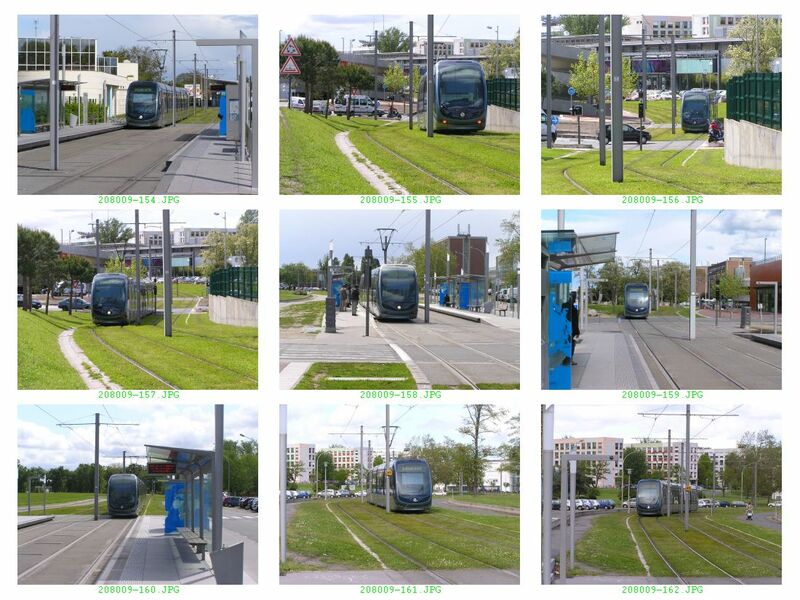 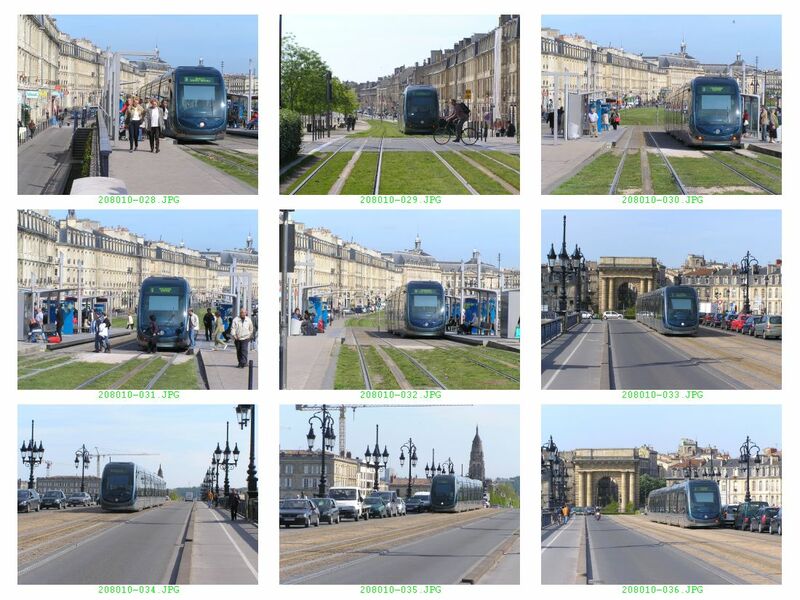 It has fully justified the confidence shown in it by the Mayor of Bordeaux and famous national politician, Alain Juppe, who was a driving force in promoting the tramway after many years of opposition by the previous long-standing mayor, Jaques Chaban-Delmas. 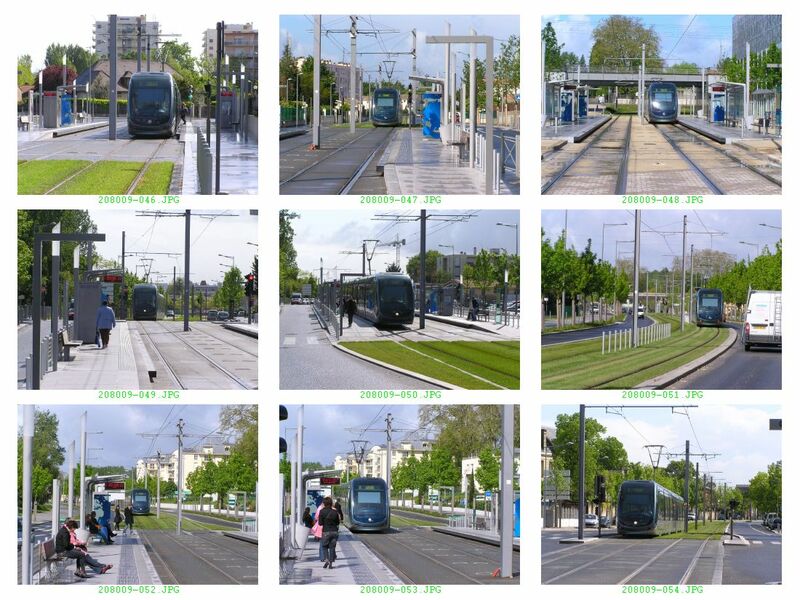 Chaban-Delmas took office in 1947 and was a key figure in the run-down and closure of the first Bordeaux tram system (and the trolleybus network which closed in 1957) and later promoted the building of a metro system for Bordeaux. 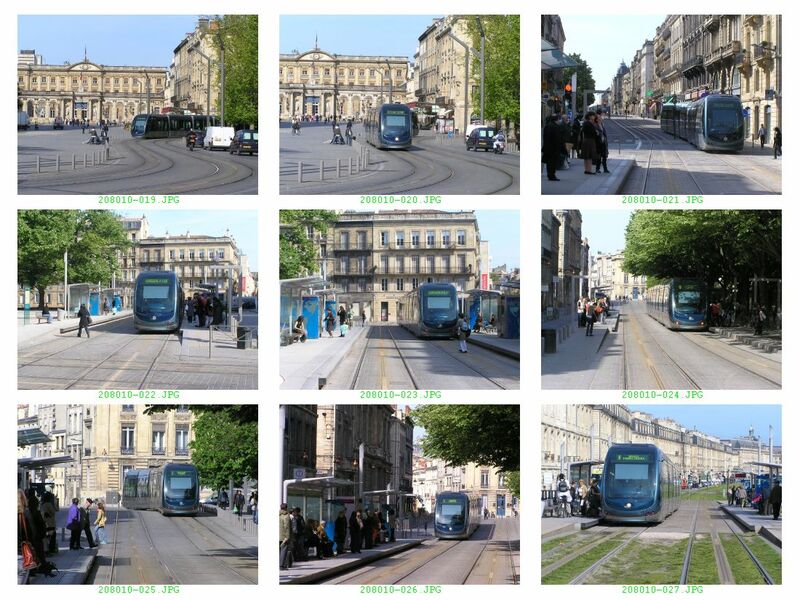 Had it not been for the massive cost, even of a VAL Mini-metro system similar to that built in Lille, and the difficulties of tunneling in the sandy soils under Bordeaux it is quite possible that Bordeaux would have followed through on its 1986 decision to adopt a system using this technology. 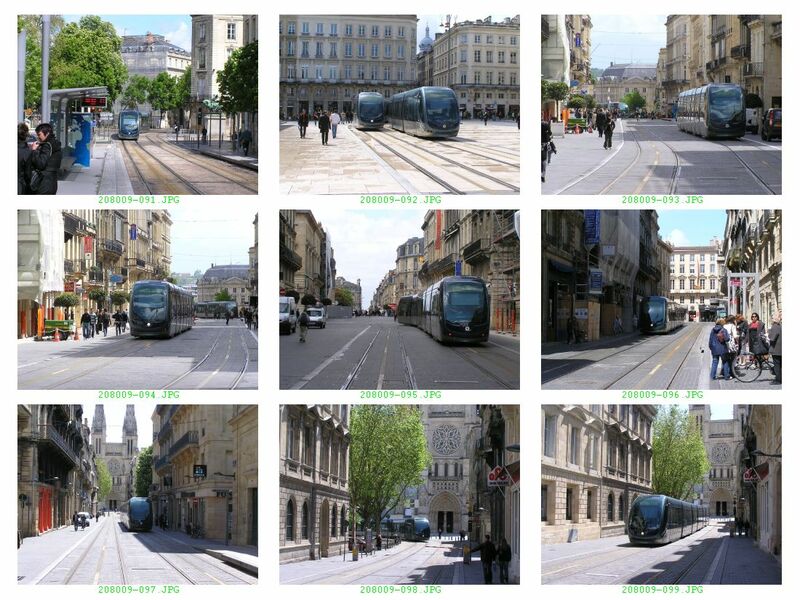 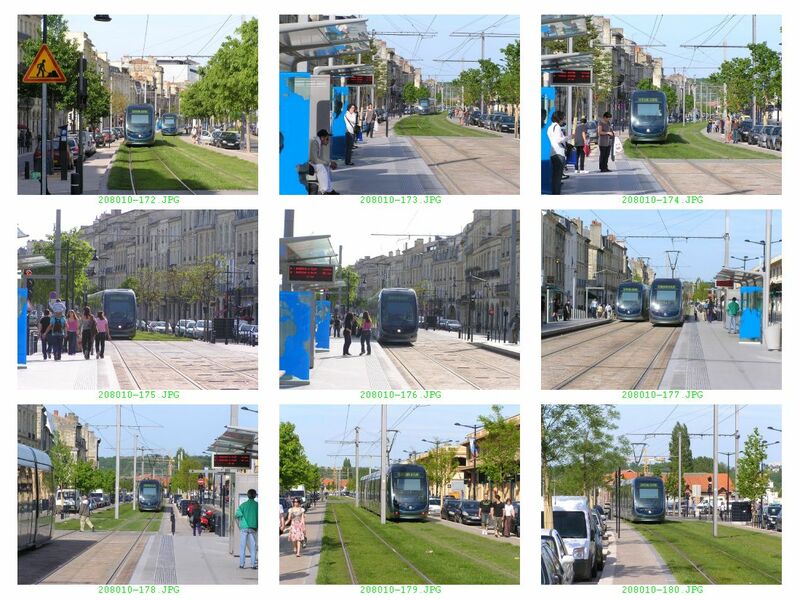 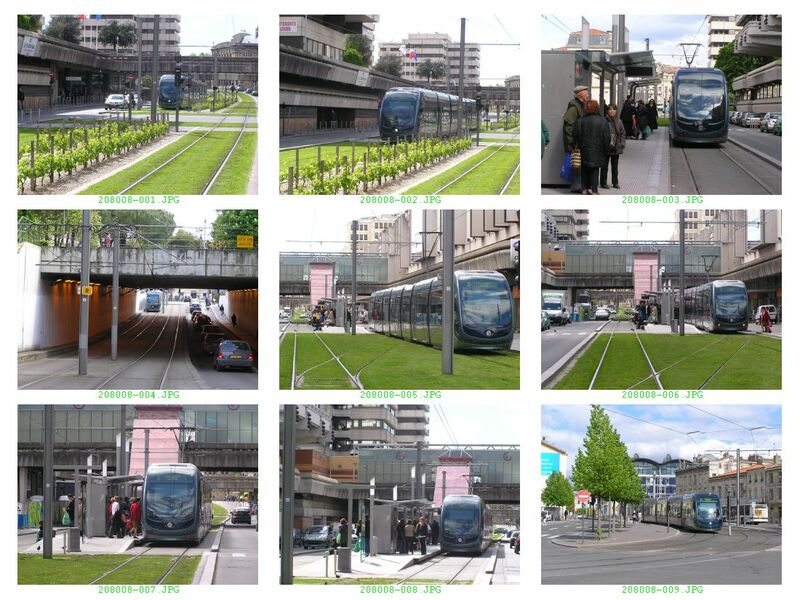 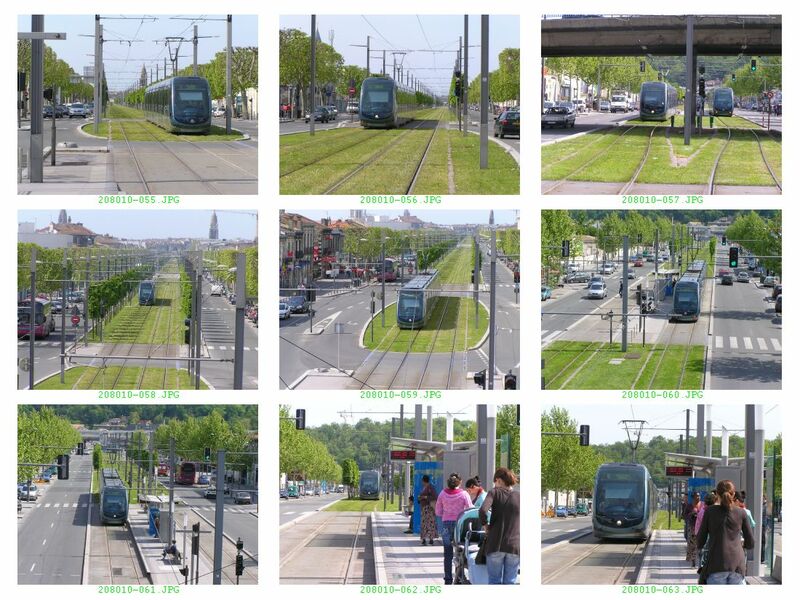 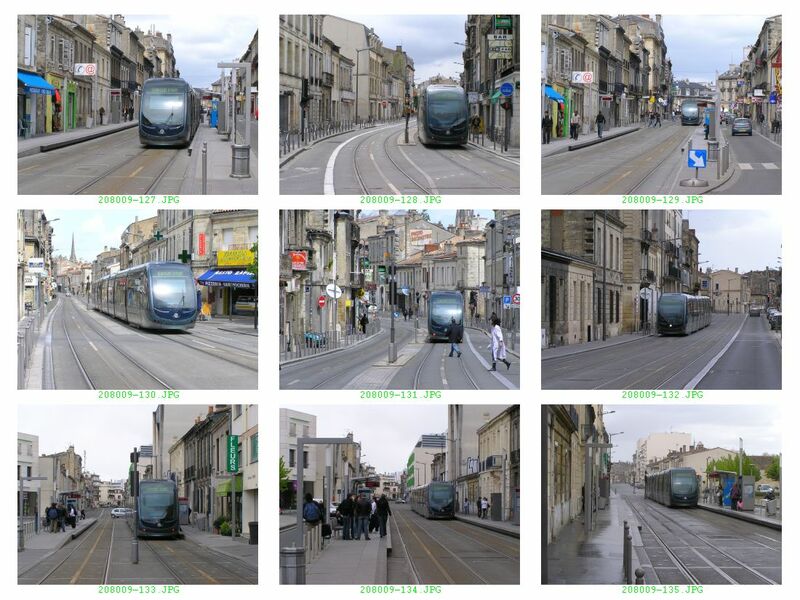 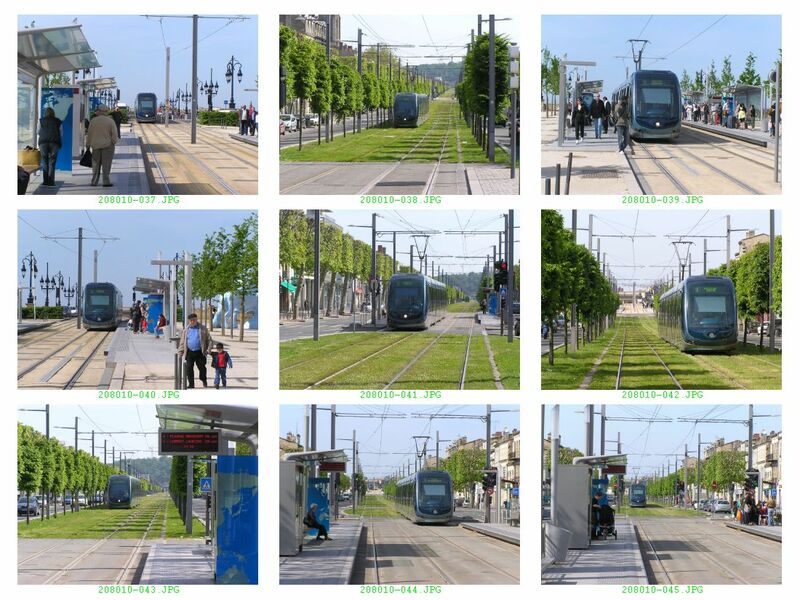 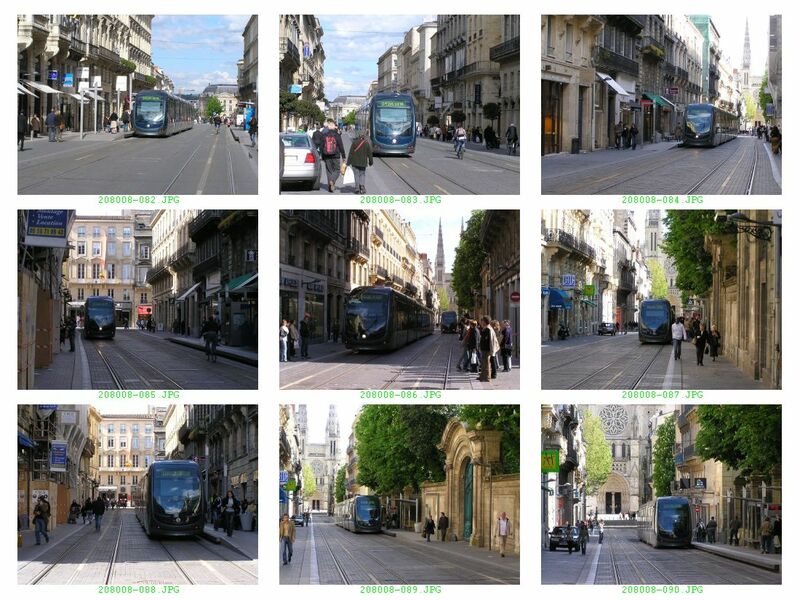 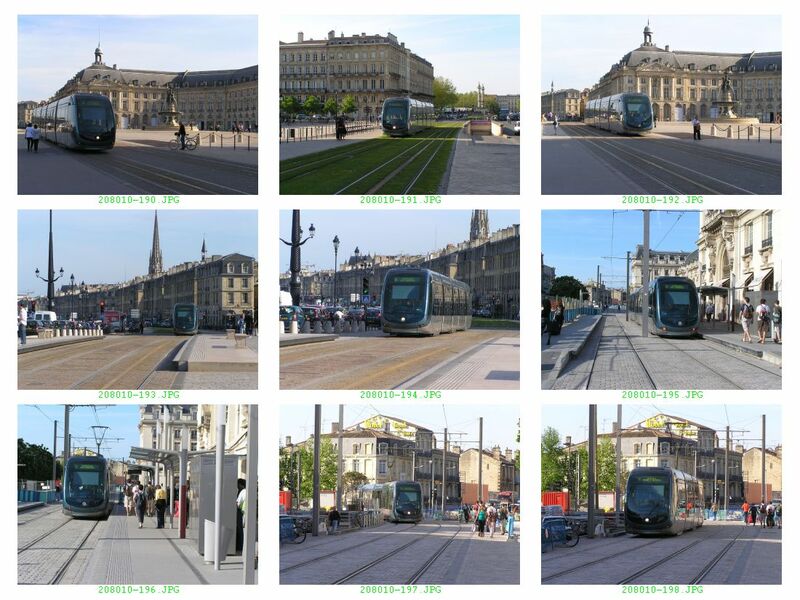 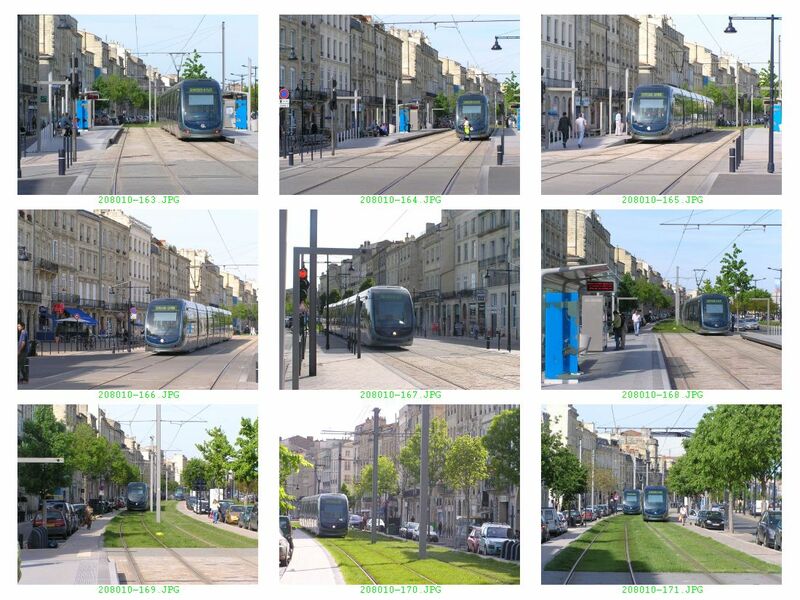 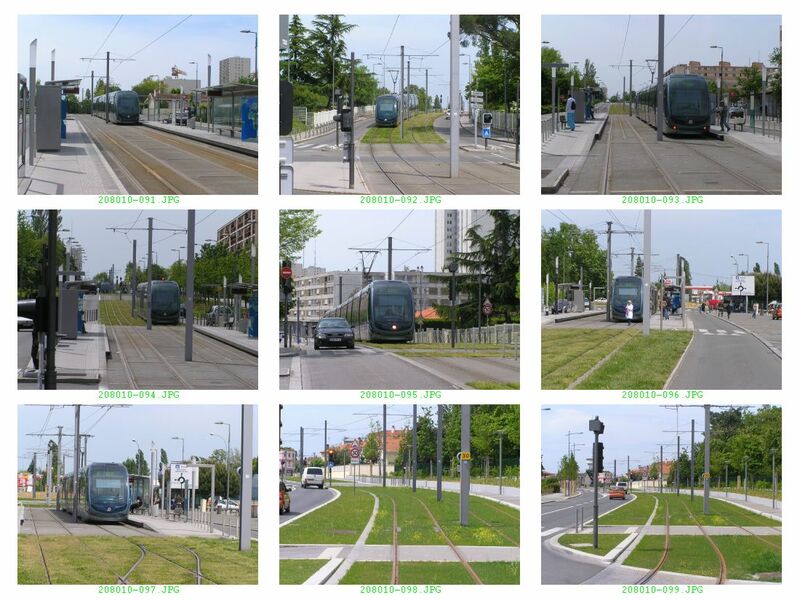 The reversal of the decision under the Juppe administration has led to the successful outcome for Bordeaux - a highly efficient tram system, covering much of the city, with sceptical neighbourhoods now clamouring to be linked to the network, and the successful implementation of the ground-level collection system which could now give an impetus to further tram building in cities which have not wished to hang wires in sensitive architectural areas.